At 20 GHz bandwidth the PicoScope 9300 sampling oscilloscopes address digital and telecommunications applications of 10 Gb/s and higher, microwave applications up to 20 GHz and timing applications with a resolution down to 64 fs. Optional 11.3 Gb/s clock recovery, optical to electrical converter or differential, de-skewable Time Domain Reflectometry sources (40 ps/200 mV or 60 ps/6 V) complete a formidable, small-footprint and cost-effective measurement package. The PicoScope 9300 Series oscilloscopes use triggered sequential sampling to capture high-bandwidth repetitive or clock-derived signals without the expense or jitter of a very high-speed clocked sampling system such as a real-time oscilloscope. The 20 GHz bandwidth allows measurement of 17.5 ps transitions, while the very low sampling jitter enables a time resolution as short as 0.064 ps. 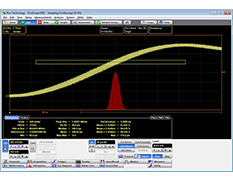 The sequential sampling rate of 1 MS/s, unsurpassed by any other sampling oscilloscope, allows the fast building of waveforms, eye diagrams and histograms. These units occupy very little space on your workbench and are small enough to carry with your laptop for on-site testing, but that’s not all. Instead of using remote probe heads attached to a large bench-top unit, you can now position the scope right next to the device under test. Now all that lies between your scope and the DUT is a short, low-loss coaxial cable! The PicoScope 9300 scopes have a built–in high–frequency trigger with frequency divider. Its trigger bandwidth of up to 14 GHz allows measurements of microwave components with extremely fast data rates. The 9300 scopes are one only model on the market equipped with a built–in internal direct trigger from each channel for signals up to 100 MHz. This full-function trigger also provides level, slope, hysteresis and holdoff controls. To support serial data applications in which the data clock is not available as a trigger, the PicoScope 9302 and 9321 include a clock recovery trigger to regenerate the data clock from the incoming serial data. A divider accessory kit is included to route the signal to both the clock recovery and oscilloscope inputs. All models in the PicoScope 9300 series can internally generate a pattern sync trigger derived from bit rate, pattern length, and trigger divide ratio. This enables them to build up an eye pattern from any specified bit or group of bits in a sequence. Eye line mode works with the pattern sync trigger to isolate any one of the 8 posssible paths, called eye lines, that the signal can make through the eye diagram. This allows the instrument to display averaged eye diagrams showing a specified eye line. 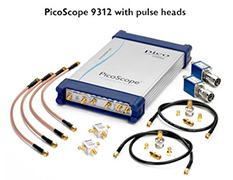 The PicoScope 9311 and 9312 scopes include a built-in differential step generator for time domain reflectometry and time domain transmission measurements. 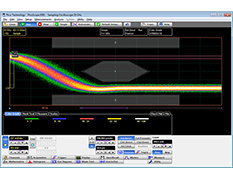 This feature can be used to characterize transmission lines, printed circuit traces, connectors and cables with as little as 1.5 cm resolution. The PicoScope 9312 is supplied with external tunnel diode pulse heads that generate positive and negative 200 mV pulses with 40 ps system rise time. 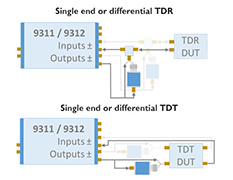 The PicoScope 9311 generates large-amplitude differential pulses with 60 ps system rise time directly from its front panel and is suited to TDR/TDT applications where the reflected or transmitted signal is small. The PicoScope 9300 Series TDR/TDT models include source deskew with 1 ps resoution and comprehensive calibration, reference plane and measurement functions. Voltage, impedance or reflection coefficient (ρ) can be plotted against time or distance. The PicoScope 9311 and 9312 are supplied with a comprehensive set of calibrated accessories to support your TDR/TDT measurements. These include cables, signal dividers, adaptors, attenuator and reference load and short. The PicoScope 9321 includes a built-in, precision optical-to-electrical converter. With the converter output routed to one of the scope inputs (optionally through an SMA pulse shaping filter), the PicoScope 9321 can analyze standard optical communications signals such as OC48/STM16, 4.250 Gb/s Fibre Channel and 2xGB Ethernet. The scope can perform eye pattern measurements with automatic measurement of optical parameters including extinction ratio, S/N ratio, eye height and eye width. With its integrated clock recovery module, the scope is usable to 11.3 Gb/s. The converter input accepts both single-mode (SM) and multimode (MM) fibers and has a wavelength range of 750 to 1650 nm. A range of Bessel-Thomson filters is available for standard frequencies. These filters are essential for accurate characterization of signals emerging from an optical transmission system. The first eye pattern, above left, shows the ringing typical of an unequalized O/E converter output at 622 Mb/s. The second eye pattern, above right, shows the result of connecting the 622 Mb/s B-T filter. This is an accurate representation of the signal that an equalized optical receiver would see, enabling the PicoScope 9321 to display correct measurements. A histogram is a probability distribution that shows the distribution of acquired data from a source within a user–definable histogram window. The information gathered by the histogram is used to perform statistical analysis on the source. The PicoScope 9300 Series scopes quickly measure more than 40 fundamental parameters used to characterize non-return-to-zero (NRZ) signals and return-to-zero (RZ) signals. Up to ten parameters can be measured simultaneously, with statistics also shown. The measurement points and levels used to generate each parameter can be shown dynamically. Eye diagram analysis can be made even more powerful with the addition of mask testing, as described below. 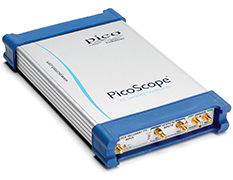 The PicoScope 9000 series also include a 11.3 Gbps pattern sync trigger for averaging eye diagrams. Eye-diagram masks are used to give a visual indication of deviations from a standard waveform. There is a library of over 150 built-in masks (see specifications), and custom masks can be automatically generated and modified using the graphical editor. A specified margin can be added to any mask to enable stress-testing. The display can be grey-scaled or colour-graded to aid in analyzing noise and jitter in eye diagrams. There is also a statistical display showing the number of failures in both the original mask and the margin. Ask for PicoScope 9300 detailed specification.